Western blot analysis of extracts from various human cells using M-CSF Receptor (E4T8Z) Rabbit mAb (upper) and β-Actin (D6A8) Rabbit mAb #8457 (lower). 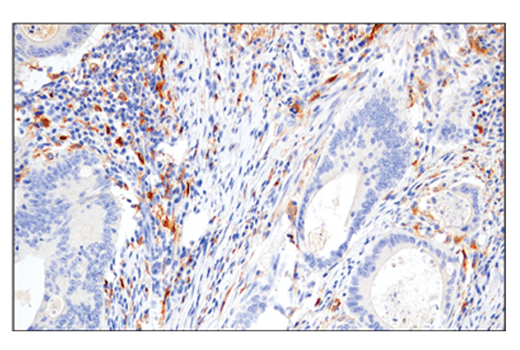 Immunohistochemical analysis of paraffin-embedded human colon adenocarcinoma using M-CSF Receptor (E4T8Z) Rabbit mAb performed on the Leica® BOND™ Rx. 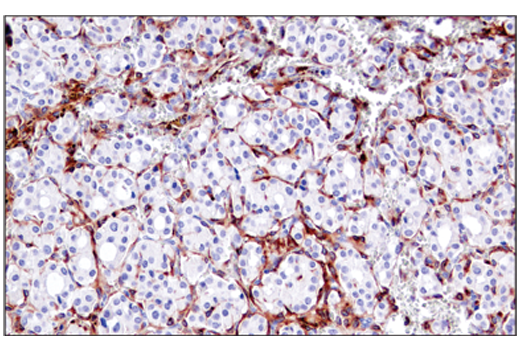 Immunohistochemical analysis of paraffin-embedded human ductal breast carcinoma using M-CSF Receptor (E4T8Z) Rabbit mAb. 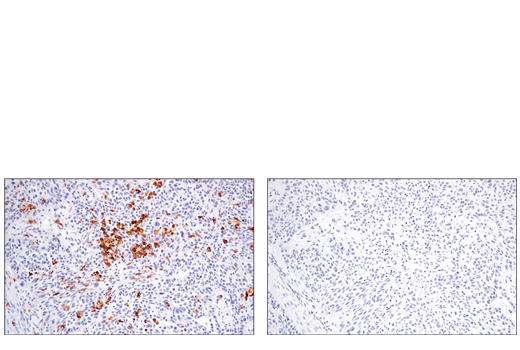 Immunohistochemical analysis of paraffin-embedded human squamous cell lung carcinoma using M-CSF Receptor (E4T8Z) Rabbit mAb (left) compared to concentration matched Rabbit (DA1E) mAb IgG XP® Isotype Control #3900 (right). Immunohistochemical analysis of paraffin-embedded GDM-1 cell pellet (left, positive) or HeLa cell pellet (right, negative) using M-CSF Receptor (E4T8Z) Rabbit mAb. 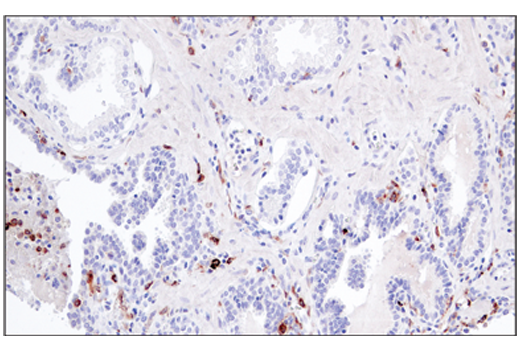 Immunohistochemical analysis of paraffin-embedded human prostate carcinoma using M-CSF Receptor (E4T8Z) Rabbit mAb. 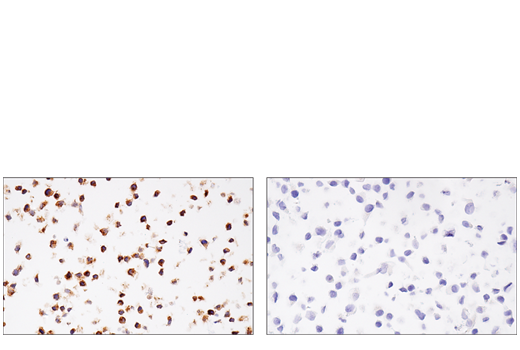 M-CSF Receptor (E4T8Z) Rabbit mAb recognizes endogenous levels of total M-CSF Receptor protein. 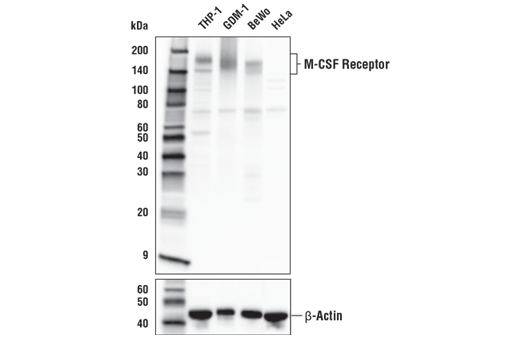 This antibody cross-reacts with an unidentified protein of 70 kDa in some cell extracts. Monoclonal antibody is produced by immunizing animals with recombinant protein specific to the carboxy terminus of human M-CSF Receptor protein. Macrophage-colony stimulating factor (M-CSF, CSF-1) receptor is an integral membrane tyrosine kinase encoded by the c-fms proto-oncogene. M-CSF receptor is expressed in monocytes (macrophages and their progenitors) and drives growth and development of this blood cell lineage. (1-3). Binding of M-CSF to its receptor induces receptor dimerization, activation, and autophosphorylation of cytoplasmic tyrosine residues used as docking sites for SH2-containing signaling proteins (4). There are at least five major tyrosine autophosphorylation sites. Tyr723 (Tyr721 in mouse) is located in the kinase insert (KI) region. Phosphorylated Tyr723 binds the p85 subunit of PI3 kinase as well as PLCγ2 (5). Phosphorylation of Tyr809 provides a docking site for Shc (5). Overactivation of this receptor can lead to a malignant phenotype in various cell systems (6). The activated M-CSF receptor has been shown to be a predictor of poor outcome in advanced epithelial ovarian carcinoma (7) and breast cancer (8). Stanley, E.R. et al. (1978) Nature 274, 168-70. Byrne, P.V. et al. (1981) J Cell Biol 91, 848-53. Bourette, R.P. and Rohrschneider, L.R. (2000) Growth Factors 17, 155-66. Novak, U. et al. (1996) Oncogene 13, 2607-13. Bourette, R.P. et al. (1997) EMBO J 16, 5880-93. Morley, G.M. et al. (1999) Oncogene 18, 3076-84. Toy, E.P. et al. (2001) Gynecol Oncol 80, 194-200. Maher, M.G. et al. (1998) Clin Cancer Res 4, 1851-6.